The end is in site! I have finished all the boy’s socks. Woo-Hoo. I’m working on the girl’s second sock. 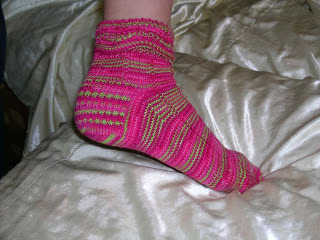 I’m doing the “Old shale” pattern on the ankle as a fold over cuff with a 7×1 ribbing over all. http://stitchesofviolet.blogspot.com/2004/12/old-shale-two-yarn-sock-pattern.html I made a couple modifications, I shortened the pattern repeat from 24 to 16 for the fold over so she can wear them with boots. I used ShiBuiknits, Orchid colorway purchased from http://www.theloopyewe.com/. They are turning out soooooo cute. It is way more fun to use a interesting pattern.